For my first day working on a shaving horse out at Duke Homestead I just grabbed whatever potentially suitable wood I had lying around, which happened to be some pieces of Bradford pear and dogwood branches I’d trimmed the previous spring, still with bark on. The dogwood was easy enough to work, the pear considerably more challenging: not only is it harder wood, but none of the branches was straight, and each had side branches that had to be trimmed, leaving knots. Back home, after I built my own shaving horse and bought a spokeshave, I had another go at the pear branches. The tricky grain made a good exercise for learning to use the tools, and with considerable patience they turned out gorgeous. So I dug out a piece of butternut I’d bought years ago, cut it for a seat, and made a stool. Pretty in a wonky sort of way, I think. The legs go all the way through the seats and are wedged in place. Since I was being traditional I finished it with boiled linseed oil, which was lovely for the pear. I’m less crazy about the butternut; where it grows (which is not here), the butternut is traditional for chair seats, and the color is nice, but the finish is a little dull. Still, it seems that Bradford pear trees are good for something after all, and when ours is finally ready to come down, it can be something more useful. 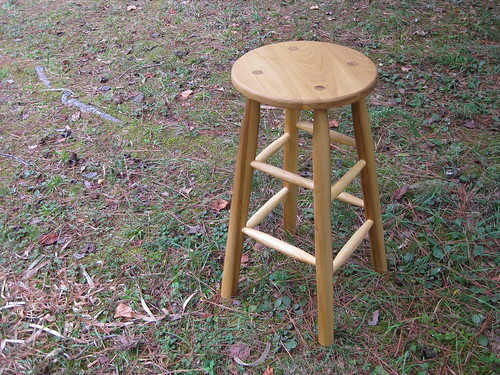 Next, to try out some more complicated chair-making joinery, I built this stool out of poplar. This is 8/4 and 5/4 sawn stock (for the legs and stretchers, respectively) and 4/4 stock for the seat. 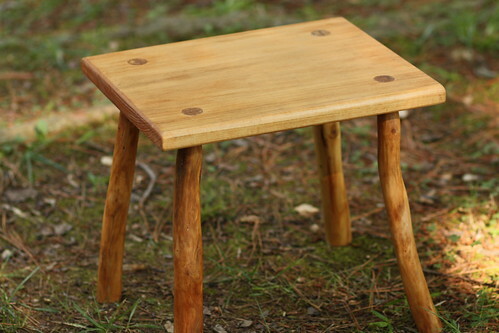 Traditionally, and properly, I’d split out billets from logs and shape them into chair or stool legs, but I don’t have a source for the wood at the moment, and I don’t have the tools for it. I’m working my way backwards, I suppose, from functional to properly done, which is more or less how I learned woodworking in the first place. And poplar isn’t the best wood for chairs, either, but while I’m learning I wanted inexpensive lumber. I deliberately didn’t sand the legs and stretchers, just left them as I’d finished them with the spokeshave. I wasn’t good enough yet to get everything perfectly round and smooth and symmetrical; there’s an extent to which that gives the piece character, and then there’s an extent to which the one I’m working on now will be better. Sanding would be cheating, anyway. So, still working on it. I may deserve the flames on the shaving horse soon. In the meantime, for inspiration (mine, if not yours) here’s Peter Galbert’s walnut stool.